Dodekanisos Seaways have now released their timetable for the first half of the winter. The period either side of the Panormitis Festival in early November sees the usual “how many times can three ships visit Panormitis in one day?” competition, and then things settle down to the standard calls on Fridays, Saturdays, Sundays, and Mondays by Dodekanisos Pride. Friday and Sunday services continue to Kos, Kalymnos, Leros, Lipsi and Patmos and return. Saturday services go as far as Kos and Kalymnos, Monday boats visit Kos, Kalymnos, Leros, Lipsi and Agathonisi. Expect much the same between January and March, except that the Dodekanisos Express will take over at some point.Edited to add – this timetable continues up to the end of March 2019. Periodically the ship used swaps between the Dodekanisos Express and the Pride to allow for annual maintenance, crew holidays etc. There will be minor variations around Christmas and the New Year due to public holidays etc. Blue Star have an extra sailing from Piraeus to Kos, Symi, and Rhodes on Sunday 4 November (reaching Symi at 07:15 on Monday 5th) and returning from Rhodes on Monday 5th at 16:00. 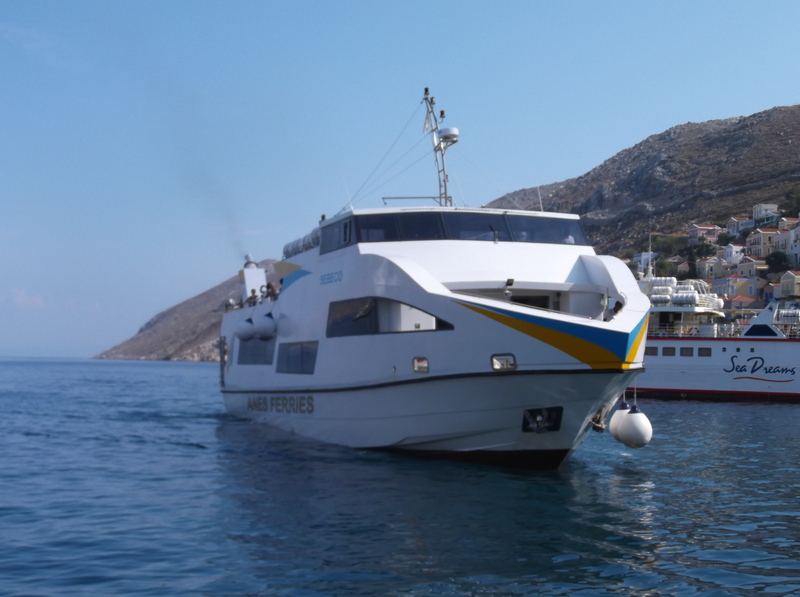 These use Nissos Rodos – note that there is no call at Santorini so Symi has possibly for the first time ever a sailing to Piraeus with only one stop. The regular Wednesday and Friday boats will likely continue all winter, but the government is as usual being dilatory in approving contracts. ANES have not said what if anything they will be doing after 31 October yet. Well, there have been a lot more than that around the world, but Cobalt Air went bust last night. They were based in Cyprus and operated scheduled flights from there to several major European airports, including Athens, Heraklion, and Chania in Greece, and Frankfurt, London, Zurich, Manchester, Paris, and Copenhagen. There are no arrangements to assist passengers so far. Claims on credit cards or travel insurance will be necessary. Very occasionally people find themselves in the sad position of waiting in the baggage reclaim area at Rhodes Airport until the very last bag is loaded onto the belt by the baggage handlers, only to find their bag has not arrived. Why does this happen, and what should you do if it happens to you? The commonest reason is that it was never loaded on to your plane in the first place, and is either still at your starting point or has been loaded onto a plane to somewhere else by mistake. It is also possible that the Rhodes baggage handlers accidentally failed to unload your bag from the hold of the plane you arrived on, or it fell off the cart on its journey from plane to baggage reclaim area. Both these last are very rare, and the extremely simple system for arriving baggage at Rhodes (one baggage reclaim area for all flights, just 4 reclaim belts) makes it highly unlikely that your bag has reached the reclaim area and you haven’t got it. Now at the departure airport, you take your bag to a check-in or bag drop desk, or these days sometimes a machine. A long strip of paper is printed and stuck to the bag (called a bag tag), with a receipt for you. Look at the receipt. Does it have the correct code for your destination airport (RHO = Rhodes)? I once had my bag checked to HKG (Hong Kong) by mistake because that was where the previous traveller at the same desk was going. That meant the long strip of paper also said HKG, and so did the bar code printed on the bag tag. At most European airports, once the bag is tagged, it disappears off down a conveyor belt out of sight. This doesn’t happen yet at Rhodes itself though we’re promised it will within the next two to three years. Once on the conveyor belt the bag is mixed in with all the other bags for all the other airlines using the same terminal, and first goes to central hold baggage scanning. Here the bag is x-rayed to check for bombs and other illegal items, and may be opened if something iffy shows up on the x-ray. Maybe your bag contains something that looks suspicious on an x-ray and it has been held back for manual inspection, causing it to miss the flight. If not the bag carries on along the conveyor system to the sorting area. Here bags are sorted either by humans looking at the destination airport code on the bag tag, or machines reading the bar code, and in either case the bag is directed onto another conveyor or chute to a holding area dedicated to your flight. Now humans can make mistakes, and machines can mis-read. Even more seriously, all those conveyor belts. scanners, and chutes sometimes tear off the bag tag. Then nobody knows where the bag is supposed to be going, which airline is in charge of it, and who owns it. So you’ve arrived at Rhodes and your bag hasn’t. The first thing to do is to report this to the ground handling company that looks after your airline. There are three ground handling companies at Rhodes – Goldair, Skyserv, and Swissport. Which one to report to? A clue – their name will have been painted on the side of the stairs you used to get off the plane. Where’s their office? One is in the baggage reclaim area itself, the other two are in the check-in hall (desks 1 to 14 area). See the person on duty, report what has happened, describe your bag. They may already know about it if the bag has been left behind at your starting point but still has all its tags. Either way, get a Property Irregularity Report sheet and number from them. Now you wait. If the bag was simply left behind, the baggage desk may well know when it will arrive, if you’re flying from an airport which has several flights a week by your airline to Rhodes, the bag could reach there within a day or so. If the desk staff don’t know when it is expected, they will give you details of the World Tracer website. Unidentified bags found at airports are entered into this, and a computer tries to match missing bags to unidentified ones. That’s why it is important to give as good a description of your bag as possible, and if possible put contact details in a side pocket or inside.Taking a photo using your phone is a good idea too – some baggage desks can upload this. Keep an eye on the World Tracer website. That’s where updates will appear as your bag is found and makes its way towards you. Ringing the airline or the airport is pointless until the bag is found. Well, it seems to be autumn now, even on warm, sunny Symi, so I’m back for my second fix of 2018.It is a lovely time to visit the island, things are gradually winding down but most places of tourist interest are still open, though the owners take each day as it comes to decide when/if they will close. So in this post I’ll describe my journey to Symi, with lots more to come. My regular 05:30 London Gatwick flight to Rhodes operated as scheduled but rather lightly loaded. For those interested, the plane actually belonged to Easyjet Europe (their Austrian hedge against being damaged by Brexit) but the crew were from the regular Gatwick base..
At Rhodes airport the rebuilding work was continuing, with attention being given to the arrivals area – two baggage reclaim belts were walled off behind temporary partitions, so things in this area were rather crowded. A trip to Rhodes Town on the island’s one and only bendy-bus followed, as I was in no hurry. That was because there were nearly 7 hours between plane arrival and ferry departure. I was trying out the Sebeco for the first time. When departure time (18:30 on the day I was travelling) was getting closer I strolled along to the Tourist Port quay – that’s the one used by ferries to Turkey and by cruise liners). Tucked in near the landward end are two berths used by the Symi II and Sebeco. Opposite the mooring points is a hexagonal building. Each side is a separate ticket window for different ferry operations, mostly the Turkish services. 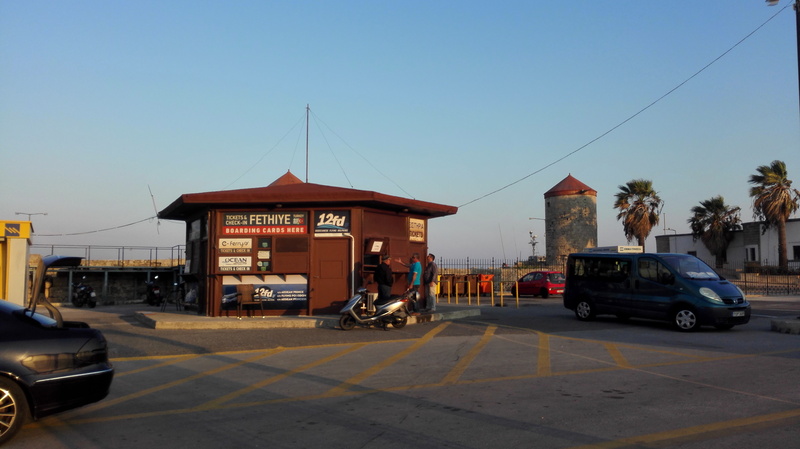 Ticket offices at Rhodes Tourist Port quay – Sebeco’s window is open, with people buying tickets. The ticket office opens about an hour before each scheduled departure. Eventually Sebeco appeared – late. However as an ambulance also appeared to collect a passenger who was being medically evacuated from Symi to Rhodes hospital, this is understandable. Once the regular passengers had got off, the ambulance crew transferred their patient, and a long hose was led on board from a waiting fuel tanker. Finally, refuelling completed, boarding took only seconds as there were just 8 passengers, and we were away 10 minutes late,through great curtains of spray as she tackled the rough seas at the north end of Rhodes Island. Don’t sit outside on the open upper deck on evening sailings unless you want a free seawater shower. Inside there was ample room! The journey was somewhat bouncy, with much rattling from some of the cabin fittings, not a lot else to say as it was dark by then. Yialos was reached still late, but safe and sound. My photo below shows a daylight arrival. Note that as from 15 October the Sebeco’s timetable has altered and the short runs to Panormitis andback have stopped for the season. This enables the afternoon trip to Rhodes toleave at 14:30 and the evening boat I caught from Rhodes now leaves at 16:15 instead.